Providing each PhD candidate with a PhD mentor, who facilitates the PhD process. Offering Doctoral Education courses specifically tuned to the needs of PhD candidates at IDE. 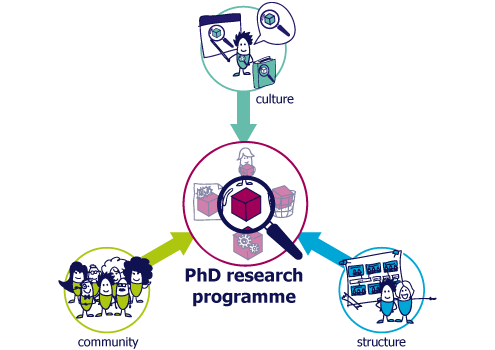 Organising events, such as PhD-Day, to promote the research community at IDE. GS-IDE is one of the eight faculty graduate schools which operates under the umbrella of the TU Delft Graduate School (GS-TUD). All PhD candidates who started their PhD project at IDE in September 2011 or later are part of both the GS-IDE and GS-TUD. For those who started before September 2011, see the 'old-style' PhD page. The GS-TUD provides general support for all PhD candidates at the TU Delft. Visit the GS-TUD website for more information. In this series of short movies IDE PhD candidates tell about their research and what it's like to do a PhD at IDE. These videos are released as a prelude to PhD-day 2016. All basic information about the IDE Graduate School and the progress meetings at Industrial Design Engineering can be found in the Meeting Manual.